That other image of the Zenith Bi Car was too hard to read, but I found this one in an old Floyd Clymer book tonight. Click the pic to enlarge it. Pete: Doesn’t look the same to me… And what is a “Watawata” belt. And did the Fafnir Engine Co. turn into Fafnir Bearing Co.? Hi Jim. I think that Greg’s photo was of a Zenith, but I showed a 1910 James as a first guess. 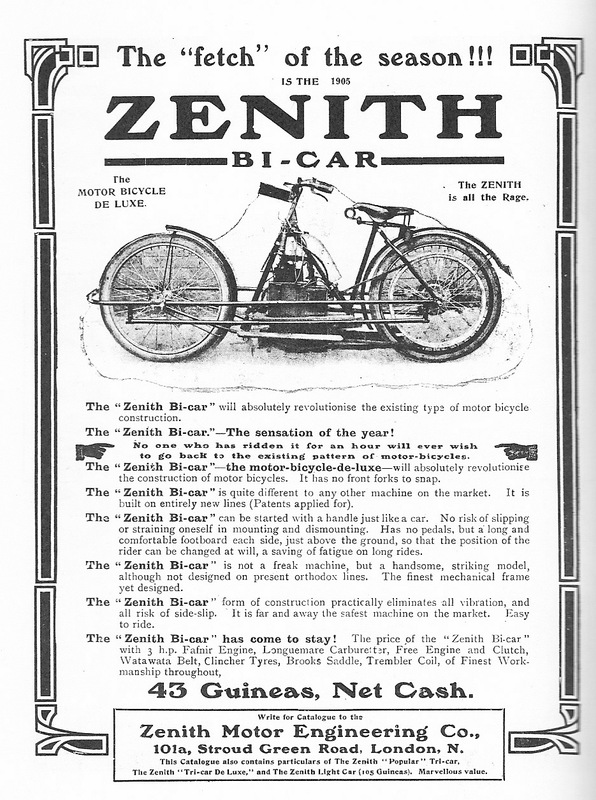 The Zenith changed a bit over the few years that it was made, my new image was from 1905. Watawata belts were drive belts. The had a long inner strip and an outer strip, joined by spacers every so often. I think that they made the sound “wata wata” when they were driven around the pulleys. I’m not sure about Fafnir bearings, but it is possible. Pete, I’m not sure but I think Jim meant that it is different to the otehr pic of the Zenith Bi-car….which it is. The front frame rail, besides going out around the wheel in the 1905 version, seems to be connected to the bottom rai at both front and rear but by what perhaps are the “hinges” mentioned in the first advert you posted, whereas the front tube on that first advert seems to show top and bottom frame rails as the same piece, just looping around the front axle mounting point ….it gets curious and curiouser. Hi Pete, I’ve collected a lot of early Zenith imagery, including Bi-Car road tests etc, but have yet to see one in the metal, and nobody seems to know if one exists. A very interesting experiment, in any case, in common with so much of that era; the reason why it catches your interest no doubt. The period of the Ingenieur…not the stylist. There is a Bi-Car out in Australia, the only one I know about, The owner is not known, officially, it still exists, but I have been unable to make contact or get any other information. It is reputed to have been ridden from Melbourne to Adelaide and back in 1913. There is a full write up in the Motor Cycle of the 28th August 1905. It was invented by Mr Tooley of Great Yarmouth, but built by the Zenith Motor Engineering Co in London They did not go to Weybridge until 1909. Tony, That’s remarkable. A real pity it is not seen. I guess it must be in Melbourne….if it was here in Adelaide there would have to be some whispers around…but I sure haven’t heard any. As you may be aware I am the Zenith Marque Specialist for The Vintage Motor Cycle Club and have nearly 200 Zeniths on my register. I do know names but was “warned off” when I tried to get more details. All I wanted was numbers, and to communicate with the owner and pass on copies of the literature that I have in my collection. I have met this before when people will not give me details of bikes in their possession, you may know them?, I can assure that no names are ever used without permission. We only have registers for Zeniths from 1938, other than the LC/1 and 2, from 1934, but as all the frame numbers followed on it gives me a database to put an estimated date on a bike. JAP of course did the same thing, but from 1920 they used the prefix based on PNEUMATICS, and then WHYZDRVFOG which took us up to 1939 when they started again. This can lead to confusion, a well known journalist when reviewing the 1948 Zenith in the Motorcycle Museum in Coventry said that Zenith must have been in a bad way as they had fitted a 1928 engine?. He also said that they had built about 250 bikes after1946, that number is actually 17. I have a copy of the register. Tony D.
Unfortunately I do not have any vintage machines. Now that I am older I wish I’d taken up the chances I had when I was younger….but then racing took all my interest, and money. I have a real love of JAP V twins and machines that used them. So much so that I build replica racing JAP engines for the historic road and speedway racing guys here in Australia. All 3 engines I’ve built from scratch, from castings etc, have been based on the 8/80 model. I’ve not managed to build one for myself so far. ……time and money are aganist me, far too busy earning a living rebuilding race engines and building new ones. My real love is the Zenith JAP…. the model that took the world record in 1930….but I do ahve a soft spot for that “different” OEC model that was originally credited with the record. I would love to build a replica of both….and USE them. I’d love to take one to the salt and just have fun chasing a record. Fortunately we have Lake Gairdner in the mid north west of our state, I would not have to go to Bonneville to do it. But who knows what might follow! So far the JAP 8/80 solo racers have not made it to the track, their owners are taking a loong time to finish their builds. But the last one I made has been racing in classic speedway sidecars for over a year now, most recently taking out the presitgious Mildura Wintersun Classic event, putting the Vincents in their place. Big smiles all ’round here. The customers for these engines did not want magnetos, they’d heard stories of the troublesome drive and are scared of the reliability of magnetos….totally unjustified in my opinion, but they are the customer. Mine will have two glorious magnetos. my name is Tom and i am living in Austria, since yesterday i am the proud owner of a Zenith motorcycle from 1925 with a 550cc SV Blackburne engine. You wrote, that you are the Zenith Marque Specialist for the VMCC and you have a Zenith register. It would be great, if you could contact me, then i can send you the numbers etc. from my Zenith. Hi Tom. Your bike looks great! I’m not the marque specialist for the VMCC though. It was A.B. Donnithorne last time I checked, but an email to Pam Goodfellow: general@vmcc.net will lead you to the good info. Enjoy your new bike! request the contact to Tony there.